Rule #1: Take Your Life Off of Hold. A country could be run on the energy some women put into endlessly thinking about and discussing how to reach marital status quick, fast, and in a hurry before the biological clock strikes midnight. Their energy is not spent on living a purposeful life, and the joy that other areas of life offer is ignored, for the most part. We call this common disease one-tree-itis—concentrating on the one thing you don’t have while missing the enjoyment from everything else that is at your disposal. The mother of all women, Eve, suffered from one-tree-itis and fell from grace. Ignoring all of her other options for satisfaction, she ate the fruit from the one forbidden tree. 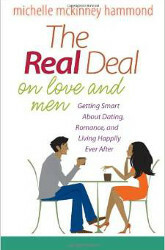 Many women have decided, assumed, or been taught that true happiness comes through a relationship with a man. So they postpone their happiness and wholeness until the right man shows up in their life. When they talk about happiness or wholeness, they immediately mention the man who isn’t there or their partner who isn’t right. They may even feel they have a good excuse for being unproductive in other areas of their lives—on which the presence or absence of a man has no bearing. Are you feeling as if God is holding out on you, refusing to give you a mate, not paying attention to your needs or desires? Are you feeling like a woman’s got to do what a woman’s got to do in order to get what she wants? Are you feeling as if taking matters into your own hands is a better gamble than waiting any longer on God’s divine timing? You can wait so long for something you think will bring you happiness that waiting actually replaces the pursuit of happiness. As you fix your gaze on that one desire, you postpone or miss your happiness because you don’t recognize present opportunities for joy. Colossians 3:15 says to “let the peace of Christ rule in your hearts.” Another translation of this verse urges you to allow peace to be the referee or umpire in your heart. This makes sense if you have ever been to a baseball game. The player hits the ball and takes off running. The fielder catches the ball and throws it to first base. The runner and ball get there at the same time. The fans who are rooting for the runner insist that he was safe. Those rooting for the defensive team insist that he was out. Both believe what they saw. The point is, what you want has a lot to do with what you see. If you want this person to be right for you, you tend to only see things that confirm your feelings. But if you allow peace to be the umpire, your heart will be able to rest in the fact that at the right time the right man will declare his love and commitment for you. That peace will enable you to see things as they really are and make the right call on your relationship. When the runner and the ball have arrived at the base at the same time, no matter what the fans believe they saw, the umpire gives a signal for either safe or out. If you do not have peace about the person you are thinking about marrying, you need to declare them out. Unrest is the Holy Spirit trying to tell you that your heart is not safe with this person. You should not marry him in this case, even if he appears to be perfect for you. He is possibly the right person, but perhaps it is the wrong time. The bottom line: If you do not have peace, then something is wrong. You must wait! Once again, this brings us back to the concept of being whole. You will know the peace of God about marriage if you have peace in general. If peace isn’t a regular aspect of your life, will you know when it leaves? When the right person enters your life, your peace will remain. When the wrong person enters, your peace will leave. But it does matter. Your disappointment matters to the One who created love. God wants our love experiences to be far more fulfilling than what they’ve been so far. Jesus demonstrated this intent when he went out of his way to meet a woman who had grown disillusioned from her experiences with love. He told his disciples in John 4:4 that he had to go to Samaria, a place “decent” Jewish folk avoided because they felt the people who lived there were beneath them. Samaritans were not kosher (or “pure”). They were a mixed race. The Jews did not agree with their lifestyles or their religious views, so they put a lot of effort into going around rather than through Samaria. Though Jesus was Jewish, he felt the need to make a stop there. While in the Samaritan desert, after the disciples left in search of food, Jesus sat down by a well to rest and waited until the woman he sought made an appearance. The Real Deal – V-Log – Episode 8 – Why Do Men Cheat? Okay, fact: God hates divorce. Fact: Because we are human and the state of our world, divorce is a reality for many. Fact: There is life and forgiveness and restoration available after divorce. If God does not condemn you, don’t let people do it either. Remember that men are not Band-Aids. I know the popular train of thought is that the best way to get over one man is with another man, but that is just not true. You need to be free emotionally and spiritually—clear and whole—before moving on to another relationship. Otherwise you bring too much baggage into the situation and you might fall into the same type of traps. So take time for you after a relationship ends. You owe it to yourself to get you back and get centered in who you are in Christ. To take stock of your world and what you would like to do differently next time. Count your blessings where you are, and surround yourself with a strong and warm support system. Celebrate God’s faithfulness and love for you. Ask and allow Him to heal your memories and your heart, to erase the negative recordings that threaten to play over and over in your head about your failings and mistakes, and to help you learn from the past and reposition yourself for a successful future. Cling to the lessons not the old emotions. Walk with God and be open to what He’ll bring into your life. He never allows something to be taken away without replacing it with something better. He is able and willing to do that, and He wants to for you. ***MONDAYS WITH MICHELLE V-LOGS*** COMING SOON!!! Find out more about Michelle’s audio and video messages, music, books, and e-books. Enter your email address and name below to sign up for Michelle McKinney Hammond’s Newsletter.